The bright sun seems to wash out the colours a bit, but I thought it would be a good plan to take a photo before the weeds and ants take hold again on the patio! I still plan to applique a narrow white border to even out the edges. But it is a nice milestone to get the English Paper Piecing part of the project done. There are around 3200 pieces -- I added it up once, but lost the paper the math was on! By some EPP standards, that is not a lot, but, it's plenty for me! I am glad to have this part done. To see all the posts on Texas Star so far, please click here. ...and another 4 or 5 are almost done. They are hard to photograph! I have not really looked at this project for about a year now. Seeing it with fresh eyes, I am very happy with how it looks so far. I'd forgotten how pretty the stitcheries are! 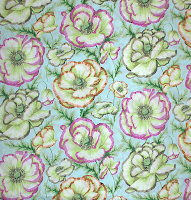 Remember this fabric that I bought after Christmas? I was going to cut it up and use it for the pieced background for BFF. But, I've changed my mind on that, again. Now, for sure, I am going to piece the background with scrappy prints -- mainly light green, and a little pale blue and yellow thrown in. 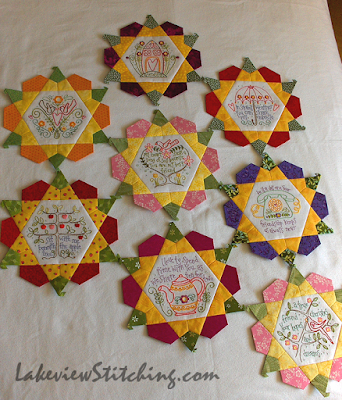 Each flower block will need 24 scrappy kite shapes to turn it into a large hexagon. It sounds like a lot, but it is actually a simpler plan than some of the ones I've considered! I know you will laugh, but I've also been considering making this quilt larger. The complete BFF pattern set has 32 stitcheries, and I didn't stitch them all. Since I've decided to make the background scrappy, the project is more scalable, and I may embroider a few more. To see the posts so far on Best Friends Forever, including all the stitcheries, please click here. We have company coming this Sunday, but I am still going to try to squeeze in a little sewing on BFF. Maybe start a new stitchery? We'll see. 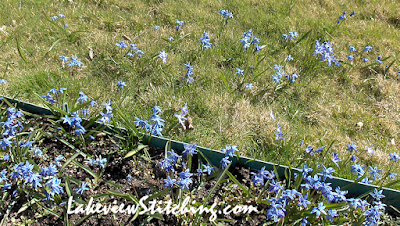 In the meantime, you can see what everyone else is doing for Slow Sunday Stitching right here. 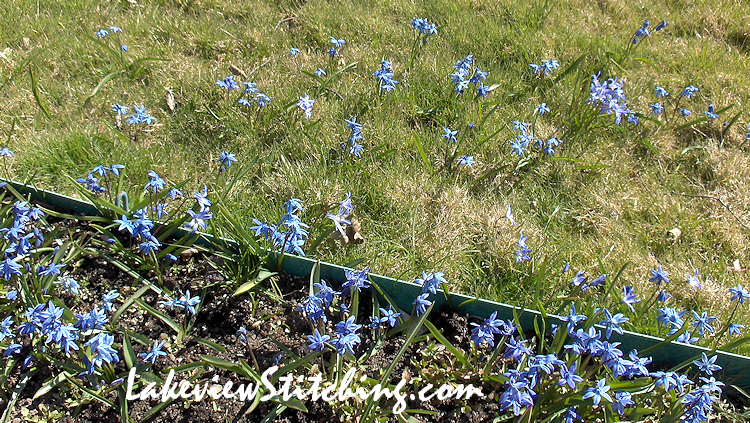 We have just a few flowers in the garden now, but in a week there should be lots more. Enjoy your weekend! Your Texas star quilt is stunning, I love those BFF stitcheries the colors are so perky. Thank you, Deb! It really has been nice to "rediscover" BFF. I love those colours too! What a beautiful quilt! Quite an accomplishment. Congrats. OMG, your Texas Star Quilt is amazing. You've done a wonderful job on it. I love, love, love your BFF blocks. Goodness, your Teas Star is wonderful! That's a lot of EPP to me too! Texas Stars is out of this world. I would love to tackle something like that. 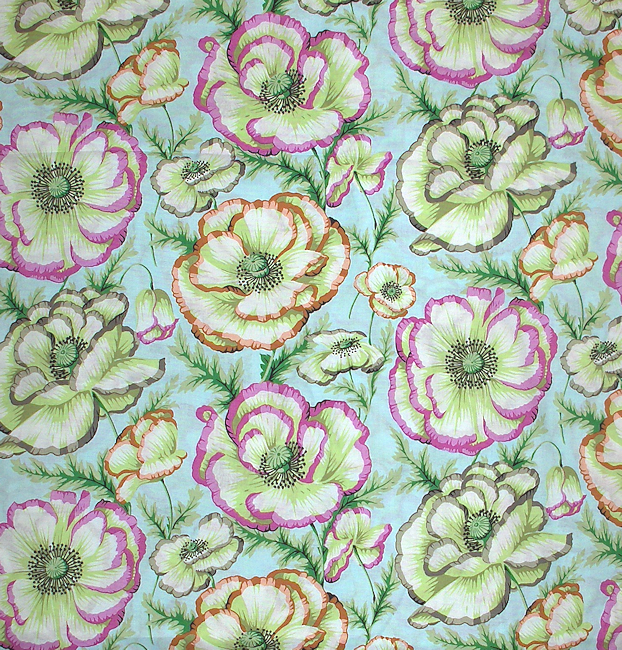 Then your other EPP project, BFF is sweet yet the colors are bright and so refreshing. Love both! Your Texas Star is beautiful. I am looking forward to seeing it with the borders on. The BFF blocks are so pretty. Enjoy your stitching. Texas Stars is looking great. I'm interested in the ay the check and striped fabric gives a kind of texture to it. Such an interesting exercise in perspective. I also love the effect of the dark plains in your BFF blocks. I'm looking forward to the impact of the background. Thanks, Jillian! I was a little worried that I had too many of those ginghams and stripes, but I think the balance worked perfectly. I never really knew how it would look until it was all sewn, so it was a big relief to see it work! "Relief" is also the word of the day for BFF, now that the background is settled. Hopefully it will be smooth sailing now! Thanks very much, Terry! It really is amazing to see them all together at last. It's been a long journey! And I'm quite enthusiastic about BFF now. Maybe today I will cut some background for it! I have a Texas Star top from my great aunt so of course, I've always loved that pattern. And your BFF stars are a delightful mix of embroidery and piecing. I enjoy looking at them in detail. Wow! Congrats on another big finish, (well at least a finish to a very significant goal). I can't imagine keeping track of all of those 3200 pieces, but clearly, it was worth it. Beautiful quilt! Nice to see the BFF again as well. Looking forward to seeing you work your magic with the scrappy background. Looks like you've got beautiful spring weather out your way. Enjoy the week. Thank you! Yes, finally, windows open all day today. And, it's nice to collect a few milestones. Now I'm wondering what the next priority is! 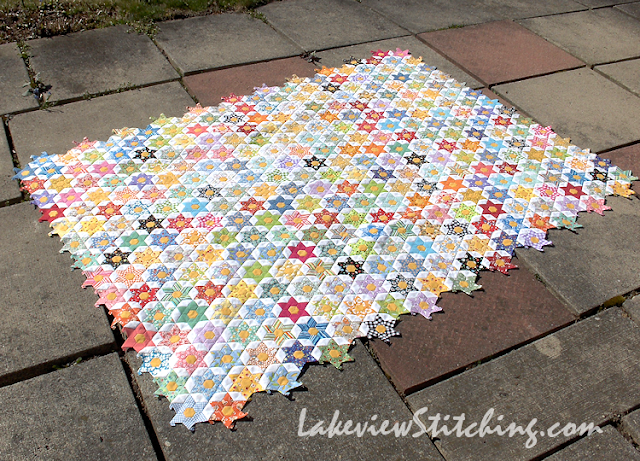 Your Taxas Star quilt is absolutely beautiful! Amazing when you think that there are 3200 pieces in it. I love your BFF stitcheries! How large are the blocks? OMG... I love love love both of these projects! The little thumbnail of your star quilt caught my eye. It is gorgeous!!!! Congratulations-- this is going to be an heirloom! EPP is one of those things that scares me a bit, so I am full of admiration for your application, as well as the fact that these are beautiful projects. 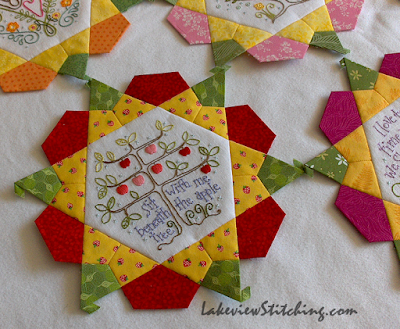 Your Texas Star quilt is a real beauty but it is your little embroideries that I adore. What lovely work you do and I am so happy to read about it.